One of my stranger Christmas finds was during a visit to the Howard County Library in search of cartoons drawn by Al Hirschfeld. 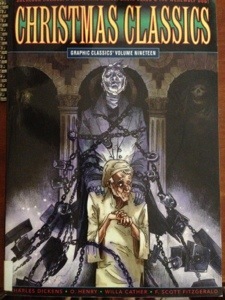 I was in the graphic novel section and came across Christmas Classics Volume 19. in addition to the standard Dickens’ Christmas Carol and The Night Before Christmas, this collection had illustrated classic Christmas tales by Willa Cather, F. Scott Fitzgerald and Arthur Conan Doyle. After I read the book, I came to a number of conclusions. First, I had never heard of these short stories. Since each is written by a famous author, I’m interested to read the full text of the stories. Some of the plot seemed nonsensical in cartoon. Is this because the story itself is lacking or because of the way it is told through art? Second, I admit I do not know enough about graphic novels. I did not enjoy some of the illustrations because of their different styles. I often skip over the cartoons in the newspaper based on their illustration style, and for me, weird is not necessarily better. I read a review on Amazonand all it did was confirm that I am not the best audience for graphic novels. Despite my “bah humbug” attitude, the book was an unexpected gem–something worth purchasing and gifting to a young reader who maybe ranks the horror of Halloween above the sugar-coated tales of Christmas. The macabre is refreshing! As we all wrap-up our days of friends, family, food and fireworks Christmas is likely not on your mind. It certainly wasn’t on mine. I just wanted to get a nice cool drink and some aloe. I did flip on the tv and caught a little coverage of the National Symphony performance on the Mall in Washington. They were wrapping up the show with a performance of Stars and Stripes Forever, the most well-recognized of all the Sousa marches. The song was officially named our National March by Congress. I like Sousa but there are two things that always drive me nuts when it is performed. First the way people like to clap, but can never keep a steady tempo and second, when the sing lyrics to the march. The second was in full effect and lead me to search to find out where those words originated and why they were added to the song. I was surprised to find a Christmas connection to Stars and Stripes Forever! 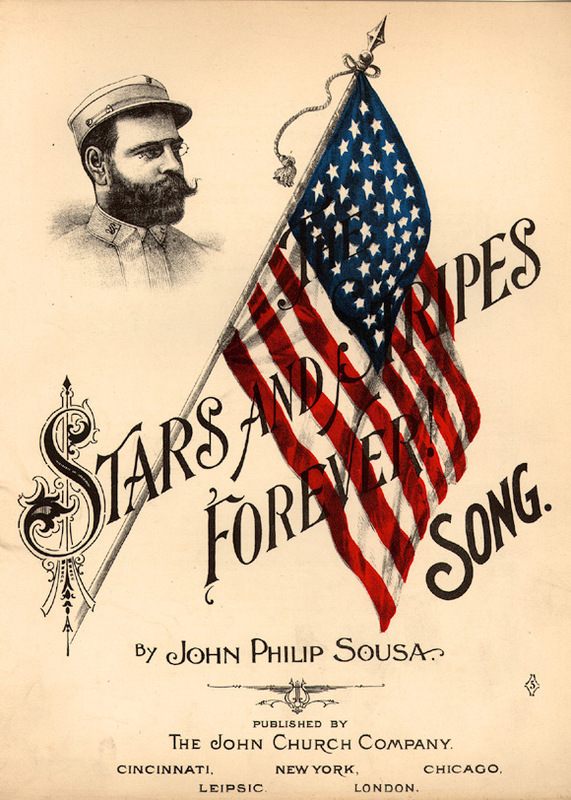 John Philip Sousa was in Europe on holiday with his wife in 1896. He received word that his long-time friend and manager of the Sousa Band, David Bakely, had died suddenly. Sousa boarded a boat to rush home to handle the affairs of the band. It was on the ship back to the States that Sousa imagined the entire musical composition. It was on Christmas Day! He created it all in his mind and committed it to memory, not putting it on paper until he arrived in port. Take a listen to an early 1911 recording by Sousa’s Band.